First of all: Yes, the nib in the pictures is a steel one, and no, that is not the standard nib. 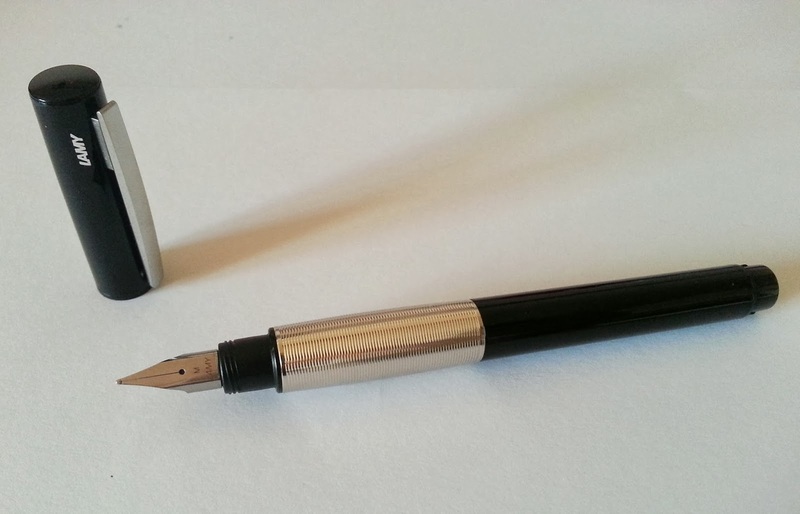 Normally, the black laquer version (the more expensive version) comes with a 14ct gold nib. But my dad and I swapped barrels (I originally had the silver annodized aluminum version, the 'cheaper' one with the steel nib) I don't mind the steel nib though, as it is by far THE smoothest Lamy nib I ever had. I don't know if it's due to quality control, but there seems to be a slight difference between every lamy nib I ever owned or used. This clearly is a very good one! But nevertheless, every lamy nib is great really. That's what I like about this brand, you know you're getting great value for money, because they always have great nibs, even their cheapest pens write smooth, wet, and effortless! But obviously, the barrels get fancier if you are willing to pay more! The cool thing about this pen, is the grip section. 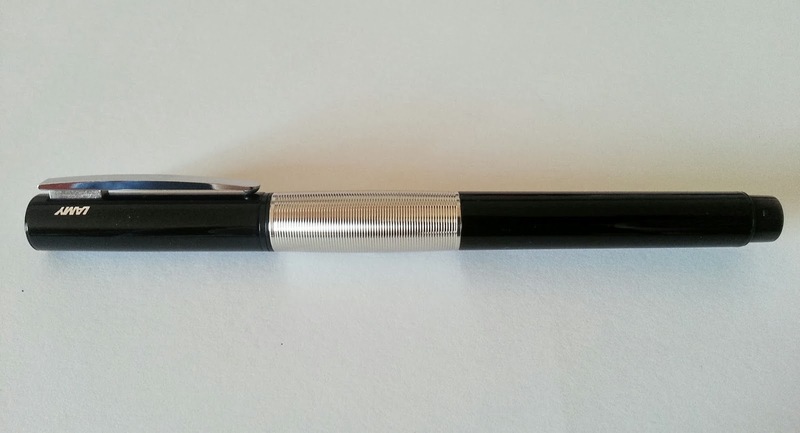 It is a separate piece, so you can buy other designs and materials to 'customize' your pen. I think this is an awesome feature, as the pen can have a totally different appearance by changing the grip section! I personally prefer this ribbed chrome grip section, as it is fancy, it adds some weight to the pen, and it offers a decent grip. But even without this cool feature, I would still love the design of this pen. It is very straightforward, just a simple, glossy barrel and a chrome clip (and of course the grip section of your choice!) It isn't heavy on it's own, but some grip sections are heavier than others (mine is very heavy, wooden versions are lighter). And it isn't a huge pen either (I can still use it unposted though!). But the cap can also be posted very securely, so even people with larger hands will still find the overall writing size to be very decent! The price: the steel nibbed version costs about 60 Euros/ 80 USDollars, but it looks like they are slowly being discontinued, so they might not be as easily available as they were a few years ago. 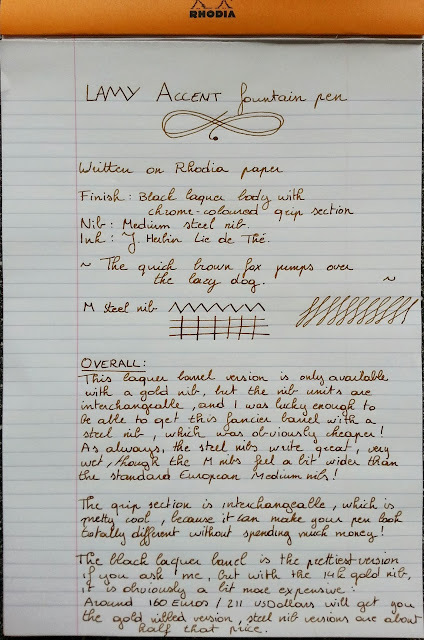 The more expensive, laquer-barrel version with a gold nib costs about 160 Euros/ 220 USDollars nowadays, so it is definitely not cheap, but it is still reasonable for a pen with a gold nib!